If you have been tormented by wtches come diwn and hunt with us. They are the devils servents and deserved to be killed! We have hanging every wedsdays. If you think you or someone else is a witch drown them and if they swim away there are a witch. 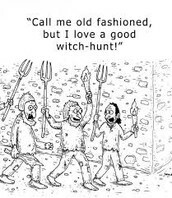 We have supplys to hunt the witches with, so no need to bring your own. We have tourches, guns, sword, and pichforks.